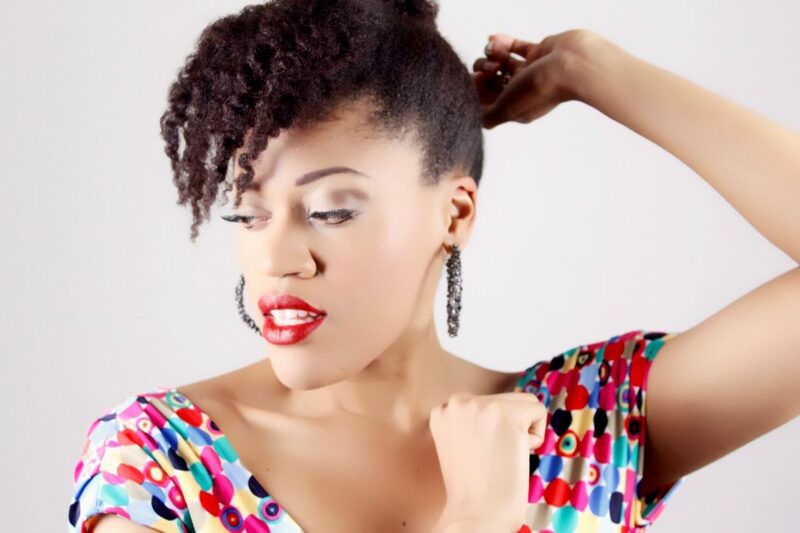 We were really excited to catch up with Singer, Songwriter and Music Producer, Elan Noelle. Elan is a seasoned session vocalist, and one of our top rated service providers here on AirGigs. Outside of the recording studio, she is also the lead vocalist in the popular East Coast based dance band known as Amaretto. Tell us a bit about how music / singing came into your early life, and what it meant to you. For as long as I could remember, music has always been a major influence in my life. In my childhood years, my parents were always playing records from various artist like, Earth wind and Fire, Pat Metheny, Weather Report, Luther Vandross, Chaka Khan and a plethora of others. I guess you can say they had eclectic taste in music, which has trickled down to me. I discovered my sining potential when I was about six or seven years of age. One Christmas day, my mother bought me and my sisters a Bert and Ernie ( Sesame Street ) tape recorder and I was in such awe of this machine. Constantly, I would record myself singing into the plastic microphone and then playing back the audio for critique . It was like a magic wand that opened a whole new door for me. I knew then that I wanted to sing. When did you first know that you wanted to pursue music as a career path? It’s hard to say exactly when the desire to pursue a professional career in music occurred but, I think it may have started in high school because that is when my sisters and I started singing together. We were always singing along to our favorite songs on the radio while we were in the car or around the house, you name it. One day my mom witnessed our ability to harmonize unrehearsed and she encouraged us to form a singing group which later became known as Zephyra. So I owe a lot of my musical pursuits to my mom. God rest her soul. Can you share a few of your biggest musical influences? Oh boy. A few is going to be hard but let’s go with, Earth Wind and Fire, Stevie Wonder, Prince, Michael Jackson,Tina Marie and Jamiroqua. Recently I’ve been listening to a lot of Shirley Bassey. She’s amazing! The emotion and power in her vocals just gives me chills. I play piano and I am teaching myself how to play the guitar. How do you approach writing lyrics, melodies and songs? When I’m producing, I typically build the song around the melody first. Then I add the beat and the other instruments. When it comes to songwriting, I tend to hear the melody in my head first and then I write the lyrics to that melody. But sometimes in both cases it’s the other way around. It’s never linear. What were some of the important lessons / experiences that helped shape you as a live performer? A couple of years ago I had the opportunity to open up for Lyfe Jennings at the Howard theatre in Washington, DC. At that time, I had just released my debut album “Beautifully Invisible” so I had to perform a couple of my songs from the album. The thought of performing petrified me because I didn’t think that my music would be well received by the crowd. I almost ended up backing out but, then I thought about how proud my mom would be if she saw me up there. Also, I had to put things into perspective and asked myself, “why did I make an album in the first place?” The answer was so clear. I wanted to inspire people, bring joy, express myself. So nail biting and all, I went up on stage and gave it everything I had. All that fearful energy disappeared and I was able to give a pretty good show. The crowd didn’t throw any tomatoes at me. In fact, they applauded and cheered when I was finished. It was one of the greatest moments in my performing career. So with all that being said, I learned that it’s ok to be afraid just don’t let it stop you. When did you first start getting into session singing and music production? I started dabbling in music production around the year 2000. That is when I purchased my first Roland sequencer. It looked like a large black calculator. I had a keyboard but it didn’t have a sequence machine so I went out and bought one. Man, I would stay in my room for hours just fiddling around with that machine and I came up with some pretty cool tracks too. About one year later, my husband ( boyfriend at the time) bought me a Triton. That’s when the magic started happening. I still have the floppy discs with all my Triton sequences on them! That should tell you how old that machine is :). As for session singing, I began doing that about 5 years ago. How you do approach working on other people’s songs? i.e. what do you find makes the process produce the best results? When it comes to working on other people’s projects, I like to get a full understanding of what they want before I begin.That way, I am able to give them what they want and it saves a lot of time for both parties. There are also challenges when it comes to creating a song or referencing a song for a client because sometimes I have to step out of my comfort zone to capture the performance they need. It keeps me on my toes. That’s what I love about this kind of work. There is never a dull moment. Tell us about experience doing remote sessions, and how your approach that process. Doing remote sessions is a lot of fun. It’s like having your own business so I have to make sure that I time manage myself efficiently. It’s a bit unconventional because you are not communicating via the telephone or in person. However, surprisingly it’s extremely productive. Plus working from a home studio gives me the flexibility to work those odd hours of the day. I also love it because I get to work with people from all over the world! I’ve worked with people from Japan, France, Italy, Spain, Morocco….. It’s pretty cool. Tell us a bit about your career these days. What are some of the things that you are currently put the most focus into? This year, the plan was to finish and release a second album but I’ve been busy working on other people’s projects so I haven’t had a chance to complete it. No complaints :). I’m almost done with it though. My first album took about a year to complete so there’s no rush. I would like to put out a full album this time consisting of at least 10 songs – Maybe even some preludes, some intros/outros and all that cool stuff. Go old school with it.